FILE - Tourists take a selfie at the Bodeguita del Medio bar in Havana, Cuba, April 28, 2017. U.S. President Donald Trump's administration announced it is implementing changes that will "channel economic activities" away from Cuba's military, intelligence and security services and impose travel and business limitations on Americans who interact with Cubans. Most Americans planning to visit the island nation will have to travel with organized tour groups operated by U.S. companies. Travelers will also have to be accompanied by a representative of the sponsoring group. Trump first announced his Cuba policy on a June 16 visit to the Little Havana neighborhood in Miami, Florida, but the Treasury Department is exempting trips booked before then. The State Department released a list of 83 hotels and other businesses that it says are associated with Cuba's military. Americans are prohibited from engaging with those businesses, which include stores, marinas and even two rum makers. 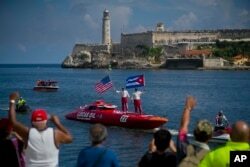 FILE - Tourists stand aboard their speedboat, backdropped by "El Morro" castle, in Havana, Cuba, Aug. 17, 2017. The new rules take effect Thursday and are a partial rollback of former U.S. President Barack Obama's restoration of diplomatic relations with Cuba in 2015, after more than 50 years of a U.S. embargo on the Communist country. Senior officials from the U.S. Treasury, Commerce and State Departments outlined the changes in a conference call Wednesday with reporters. A Treasury official said Americans are encouraged to stay in privately owned accommodations, or “casas particulares,” and eat in privately owned restaurants and shop in privately owned shops in Cuba. But the new policy raises the bar for individual Americans to qualify as supporting Cuban people, saying they have to engage in a “full-time schedule of activities that support contact with the Cuban people, support civil society in Cuba, or promote the Cuban people’s independence." Airlines and cruise operations will continue to operate as they do now. Under Obama’s opening to Cuba, trade with the island nation has not increased as much as some had hoped, but Americans' travel to the island has grown exponentially. 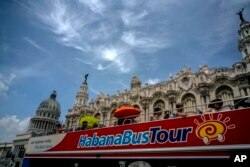 FILE - In this June 17, 2017, photo, tourists ride a tour bus in front of the Capitolio in Havana, Cuba. Lydia Barraza, the State Department's spokeswoman in Miami, told VOA that "part of the strategy of this government is to try to find ways to empower the Cuban people." "The Trump administration has yet again shown [its] hypocritical approach to human rights," Williams said in a statement. "The great irony of releasing these regulations while President Trump stands in Communist China is dumbfounding but not surprising." Democratic Senator Patrick Leahy blasted the restrictions: "These new regulations are reminiscent of the Cold War and what one would expect of a paranoid totalitarian government, not a democracy like ours. The hypocrisy of the White House ideologues is glaring." FILE - Tourists sit on a balcony at a restaurant in Old Havana, Cuba, April 28, 2017. In an interview with VOA, Elizabeth Newhouse, director of the Cuba program at the Washington-based Center for International Policy, called the restrictions “distressing.” She likened the new restrictions on American interactions with Cubans to more of a “Cool War” than a “Cold War,” saying requirements for travel were going back to the way they were before the Obama opening. But Newhouse said that she saw "lots of lots" of American tourists when she recently visited Cuba and that the establishment of commercial flights has transformed U.S. travel to the island. She said the State Department’s travel advisory for Cuba, issued after "health attacks" on 24 U.S. diplomats in Havana, has put a damper on travel. Investigations continue into the mysterious illnesses suffered by some American diplomats. The Trump administration has dramatically reduced the number of U.S. diplomats in Cuba. An administration official told reporters at Wednesday’s briefing that the new regulations have "nothing to do with the acoustic incidents." VOA's Wayne Lee contributed to this report. The Spanish Service's Jose Pernalete contributed from Miami.